Highly concentrated (dilution of 1:300), strong alkaline mix ideal for washing cars and trucks. Its creamy foam is characterised by its extraordinary cleaning and clinging capacity. It can also be used for washing vans and trucks and also works well as an insect remover. 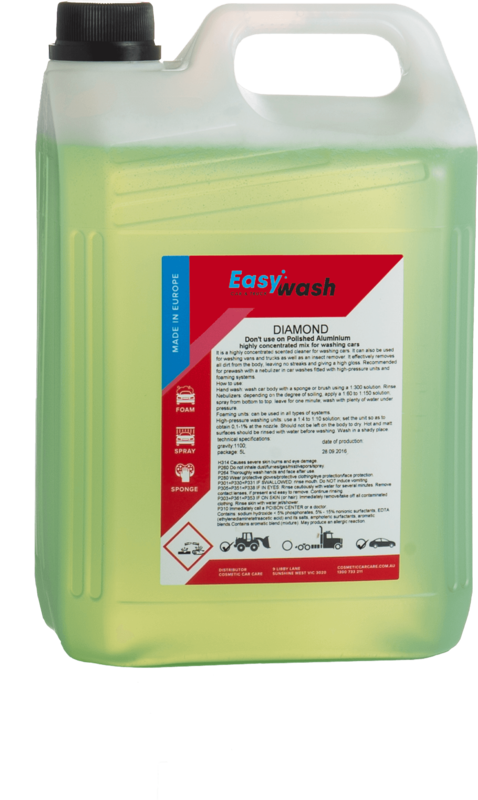 Easy Wash Diamond effortlessly removes the heaviest level of soiling. Recommended for prewash with a nebulizer in car washes fitted with high-pressure units and foaming systems. This product SAFE ON ALLOY has been designed especially for Australian conditions. Jumbo Foam is safe for use on polished alloy for cars and Australian trucks.